The economic meltdown has Latvians reconsidering decades of neoliberal policies. 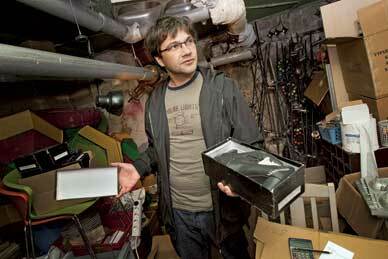 AKIM AGINSKY FOR THE PULITZER CENTER Valdis Novikovs sells remnants of bankrupt businesses from a rental space in Riga. Kristina Rizga reported from Latvia on a grant from the Pulitzer Center on Crisis Reporting. Gatis Visnevskis contributed research for this story. View a slideshow of images from Latvia, with photographs by Akim Aginsky and captions by Kristina Rizga. Despite his 33 years, Valdis Novikovs still radiates teenage energy and a hunger for adventure. Latvia is a small country (population: 2.2 million), and like a lot of young people who felt suffocated and needed to get out, Novikovs left for England in 2005. He worked as a sous-chef at the Hard Rock Cafe in Birmingham and shared a studio apartment with a Polish roommate. When he went back to Latvia two years later, he barely recognized his own country. The moderately ticking postcommunist economy he’d left behind had turned into a booming engine, propelling rapid changes almost everywhere he looked. In fact, “something gigantic” was happening in Latvia: sweeping across the country was the biggest real estate (and luxury car) bubble in Europe. Less than a year after Latvia joined the European Union in 2004, its growth rate topped all of Europe. As global stock markets overheated and competition for investment opportunities intensified, Scandinavian banks showered Latvia with cheap credit. Eighteen years ago, when Latvia was under Soviet rule, the vast majority of the population had no experience with banking, investments or credit; no one owned property. But by 2005 Latvians could buy everything they ever dreamed of on credit–from teakettles to Bentleys to luxury apartments. As hundreds of office and apartment towers reached skyward, some construction workers started earning more than doctors. Novikovs, who had no experience in construction, got a job as a “plumber’s assistant,” in addition to managing a Jamaican-inspired restaurant, Coco Loco, at night. He was making more than $2,800 a month in construction alone, twice what he made in England. Increased earnings and easy credit fueled a hunger for owning property. Oskars Kurdeko felt anxious that by 2007 he still didn’t own a home. “All of my friends had already bought their apartments,” Kurdeko explains. A percussionist for two local pop-rock bands, Putnu Balle and Tumsa, Kurdeko saw his income shoot up 70 percent that year, fueled by corporate gigs. He took out a $272,000 mortgage on a two-bedroom apartment in Riga with no down payment. But as the global financial storm swept across Europe, the dreams of Latvians like Novikovs and Kurdeko were blown apart. By the end of 2008 Novikovs had lost both his jobs. Kurdeko’s monthly mortgage payment now exceeds his pay, and his apartment is worth a fraction of what he owes on it. He’s not alone: almost a third of all Latvian households have mortgages for homes or apartments that have dropped 50 percent in value since last year–the deepest plunge in the world, according to the Global Property Guide. Novikovs now runs a business selling off remnants of other businesses that have closed or gone bankrupt, including his former restaurant. In May his headquarters–a small, dark rental space in a dilapidated Soviet-era building–was packed to the ceiling with more than 800 pairs of imported shoes, which used to sell for $40 but now go for $5. In one room, Italian sports bras piled up on top of a steel refrigerator. Recently, he and his partner started selling wood processing equipment and other machinery, as local manufacturing output continues to drop. Latvia’s economy has been among the worst hit by the global economic crisis, and it is now coping with Europe’s second-deepest recession, after Lithuania. Its GDP dropped by an annual 19 percent in the second quarter of 2009. In February 2008 its government requested an emergency bailout loan from the International Monetary Fund. The IMF, with the help of the EU, approved an emergency aid package of more than $10 billion. Per capita, it is estimated to be one of the IMF’s largest bailout loans. Outside Riga, among the hardest hit are the large farms, which increased by 25 percent between 2005 and 2007, fueled by easy credit. “It’s very hard for large farmers right now, who focused on producing one thing, like milk or grain, and took out large loans to expand their facilities,” explains Liga Martuzane, a small farmer in Adazi. Now that the prices of grain and milk have dropped, many farmers are drowning in debt. Martuzane mentions the tragic suicide last year of her friend Gatis Karlovs, who operated a large farm. In February more than 1,000 farmers blocked the streets of Riga with their tractors in anger over the government’s failure to protect them from the onslaught of subsidized EU imports, which they believe contributed to their bankruptcy. The protesters forced the resignation of Martins Roze, Latvia’s agriculture minister. The IMF and EU emergency loans have their own downside–they are given on condition of drastic cutbacks in government spending. The Latvian government has agreed to cut about $1 billion from its budget each year until 2012, the year it hopes to adopt the euro. Government officials waited until the day after the June 6 municipal elections to announce 10 percent cuts in pensions and 50 percent cuts to teachers’ salaries. They feared the same public reaction that shook the country on January 13. On that day more than 10,000 people took to the streets to protest spending cuts. What started as peaceful protests turned into the worst riots Latvia has seen since the collapse of the Soviet Union in 1991. Prime Minister Ivars Godmanis dissolved his center-right government coalition and stepped down in February, but his successor, Valdis Dombrovskis, assembled another center-right cabinet, which has pursued the same fiscal austerity policies. Latvia has since seen four more massive protests, as many Latvians feel that the cuts are arbitrary, without any clear vision or planning, and are directed disproportionately at the masses. “It just doesn’t look to me like the top is making the same sacrifices while they squeeze the bottom,” Dagnija Kamerovska, the director of a local homeless shelter, said in May. The Latvian state controller, Inguna Sudraba, came out with a preliminary report in September that found that most large state bureaucracies, which swelled in the boom years, hadn’t made the required 20 percent cuts in their salaries. In the meantime, budget cuts are affecting areas like education and healthcare. On September 6 more than 400 protesters blocked two bridges to oppose the closing of the only hospital in Bauska, a rural city about an hour away from Riga. “Bauska’s hospital has been here since the nineteenth century. It lived through both wars, all regime changes…. I don’t understand why we have to close it,” Bauska’s City Council chairman, Valdis Veips, told the Latvian newspaper Diena. Instead of explaining the closure, government officials sent in a special unit to break up the protest. A Bauska newspaper reported the next day that city residents had received a government fax stating that financial support for the hospital, though reduced, would continue. As Latvia prepares to receive the third installment of the $10 billion package from the IMF and the EU, the British Telegraph reported on October 5 that Sweden’s finance minister, Anders Borg, had told banks secretly to prepare for the collapse of international talks. According to the Telegraph, Latvia’s government had failed to deliver a 20 percent cut to pensions and a 15 percent cut to public wages, as requested by the lenders. Meanwhile, the pain and suffering in Latvia continues. Unemployment has already doubled this year, and the IMF reports that more than 10 percent of Latvia’s borrowers are over ninety days late on their mortgage payments. Although banks have resisted evicting homeowners, they haven’t been totally idle; in June, on an unused airstrip at the Riga airport, more than 500 cars, trucks and bulldozers sat idle, all repossessed by the banks. Since my mother and I emigrated from Latvia to the United States in 1994, I have visited my homeland every year. As I traveled around Latvia in May, I wondered, How did it get so bad? How did Latvia go from being one of the most developed regions in the Soviet Union to an area experiencing one of the worst depressions in the world? The trajectory began in 2004, when Latvia formally joined the EU after nine years of negotiations. Credit rating agencies blessed the deal, with Moody’s upgrading Latvia from a “stable” to “positive” grade in 2005. According to the Bank Association of Latvia, loans and cheap credit quadrupled from 2004 to 2008, reaching 95 percent of Latvia’s GDP by early 2008. Most investment went into the construction of new luxury condos and office buildings–rather than export capacity–under the assumption that real estate values would grow indefinitely. The rest went into buying imported goods, many of them subsidized, weakening Latvia’s local manufacturing and export base. By 2007 Latvia had the second-highest trade deficit in the EU, after Bulgaria. To make matters worse, the real estate bubbles in England and Ireland sucked away local labor. At the same time Valdis Novikovs left for England, an estimated 1.5 percent of Latvia’s labor force went abroad. Unemployment dropped to an unprecedented 5 percent in Riga, and from 2006 to 2008 the cost of labor doubled. As inflation tripled, Novikovs noticed that local clothing and food cost almost twice as much as in England. “Latvians were traveling to Germany and Finland to buy cheaper clothes and furniture,” he recalls with outrage. In 2007 Latvians had the lowest household savings rate in the EU. The Latvian government didn’t do much to stop this economic transformation. If anything, it stepped on the gas. Riga’s new deputy mayor and millionaire Ainars Slesers, who served in the Latvian Parliament during the boom years, coined a phrase that is sure to become a symbol of the prevailing government attitude at the time: gazi grida (pedal to the metal). Enabled primarily by foreign banks, Latvia’s government created a bubble economy financed by debt without developing sustainable means to pay off these loans. Now Latvia’s economy looks like a race car that has smashed into a concrete wall. While economic indicators are a crucial part of Latvia’s story, they don’t fully explain why its bubble was the biggest in Europe or why its citizens so fully embraced extreme, gazi grida neoliberalism. Latvia’s Soviet legacy still drives much of its politics. For centuries, the territories where Latvia, Lithuania and Estonia are located served at best as stable colonies and at worst as bloody battlegrounds where major Western and Eastern empires like Germany, Sweden and Russia fought for control. The Soviet occupation of Latvia in 1940 is the most recent and painful scar. As many as 200,000 Latvians were imprisoned or deported to Soviet gulags, and for the next fifty years Russian was made the sole official language in all political and economic spheres. In this context independence often took the form of cultural resistance–language, traditions and cultural heritage. My family celebrated summer solstice and Christmas in secret. I grew up in the small, rural city of Livani, about 100 miles south of Riga. My late father, Peteris Rizga, helped build a new factory, Livanu Majinas, in the early 1970s that helped move Soviets from bloc apartment buildings into modern, single-family houses. My Jewish mother, Fruma, worked in the glass factory Livanu Stikls, which produced some of the most coveted vases and glass in the Soviet Union. Thanks to these and other new factories, rural Livani was transformed into an industrial center. A similar trend of Moscow-driven strategic industrialization took place across Latvia, absorbing laborers and military personnel from other Soviet republics. These waves of migration changed the Latvian share of the population from 75 percent in 1935 to 52 percent by 1989. Today, Latvia has the highest proportion of Russian-speaking minorities in the Baltic states, raising the fear of cultural extinction more acutely than in neighboring countries. In the ’80s my mother became very active in the Independence Movement of Latvia. On January 13, 1991, she packed sandwiches, made hot coffee in a thermos and said, “We are going to defend Riga from the Soviet tanks.” Thousands of farmers drove their tractors from across the country to use them as shields. Small fires flickered throughout downtown Riga at night, as my mother and I passed out hot coffee. On March 3 of that year, 70 percent of the Latvian public voted in a referendum to support independence, and on August 21 Latvia officially regained its independence. I was 14 then, walking around with an inflated sense of pride and self-importance. My mother and I had helped defeat Russian tanks without any guns. At the time, Latvians feared that in a full democracy, the Russian-speaking minorities might elect Russian communists back to power. In Riga only about 40 percent of residents were ethnic Latvians; the rest were Russian-speaking minorities–Russians, Belarussians, Ukrainians and other ethnicities. In 1991 the party my mother supported initiated stringent citizenship laws, naturalizing only those who could prove their residence in Latvia before 1940, as well as their descendents. Under these laws, my mother, who had come from Ukraine in 1956, could not become a citizen. She felt betrayed. In 1994 she and I packed our entire life into two suitcases and came to the United States. In the late 1990s the Latvian government started gradually reforming its citizenship laws–and now they are similar to those of the United States–but for years citizenship laws that favored ethnic Latvians kept Russian-speaking minorities from joining the country’s political elite. In its drive to contain Russian influences, the Latvian government also prioritized entry into the EU and NATO, a policy goal that overshadowed other domestic priorities, like stimulating local manufacturing or supporting agriculture. As in most Eastern European bloc countries, Latvia’s politicians looked to the West, and the United States especially, for economic models. The resulting reform strategy of the ruling Latvia’s Way government during the ’90s is often characterized by Western analysts as “soft shock therapy.” Latvia has had a flat tax since 1997, and until this year progressive taxation has never been on the agenda of any ruling coalition. The Latvian government also refused to tax capital gains, which turned real estate trading into one of the most lucrative professions in the boom years. This unique confluence of nationalism and neoliberalism took Latvia from the extremes of communism to the extremes of capitalism in less than twenty years. Unlike its neighbors Estonia and Lithuania, Latvian left-opposition parties have not been a part of the ruling coalition in Parliament since 1991. That has meant that neoliberalism has dominated Latvian politics virtually unchallenged since 1991. Two decades of this unchallenged center-right rule have also fueled high levels of corruption. From 2000 to 2002 several international studies found that Latvia had one of the worst corruption records among its high-ranking government officials in the post-Soviet states. In 2004, when Latvia joined the EU, it received more than $1 billion in “structural funds,” aimed at developing Latvia’s infrastructure–modernizing schools and building roads and bridges, among other things. But along with those funds came a resurgence of the old Soviet-era affliction of bribery. Delna, an anti-corruption watchdog group, believes there are widespread but hard to trace kickbacks from contractors vying for lucrative government projects. In her stylish glasses and short, spiky hair, Delna’s 26-year-old Aiga Grisane looks more like a musician than a legal analyst. Grisane sees direct connections between government corruption and the Latvian real estate bubble. When Grisane monitored land development for two years, for example, she discovered that there was essentially no government regulation of construction development. “In Estonia, if you are building a bunch of skyscrapers, you have to submit a plan for roads, kindergartens, stores. In Latvia, you could do whatever you wanted.” Grisane believes such unregulated development inflated Latvia’s real estate bubble more than in neighboring Lithuania or Estonia. She observed many cases in Jurmala, a small city near Riga, where city officials passed laws erasing regulation at the last minute without any public scrutiny. Although the media cover government corruption scandals regularly, high-ranking officials are rarely caught or prosecuted. As a result, many Latvians don’t feel like giving their taxes to arrogant and corrupt state officials. Grisane also believes that a widely accepted underground cash economy helped inflate Latvia’s bubble. “Most of these construction workers were getting salaries under the table. That definitely contributes to inflation.” A 2004 report by the European Commission estimated that about 20 percent of the Latvian workforce operates off the books, compared with only 9 percent in Estonia. The economic crisis of recent months, along with the January protests and the resignations of two ministers, has been a boon for the left coalition party called the Harmony Center. It now holds the largest share of seats in Riga’s City Council, the first time since Latvian independence that the most left-leaning major party has done so. And for the first time since 1991 an ethnic Russian, Nil Ushakov, is the mayor of Latvia’s capital, home to 700,000 people, almost a third of the country’s population. The Harmony Center owes its success in large part to the charismatic 33-year-old Ushakov, who represents a new generation–young, progressive, cosmopolitan–with no record of scandals or corruption. A former journalist, Ushakov studied economics in Denmark and speaks five languages. “You can’t run your country like a business; you have to treat your country like your family,” Ushakov explained in campaign videos. Ushakov’s main opponent for mayor was Ainars Slesers, the millionaire entrepreneur who had coined the phrase gazi grida. Riga’s residents–ethnic Latvians and Russian-speaking citizens–clearly rejected Slesers’s philosophy of unregulated capitalism, and gave Ushakov’s party twice as many votes (Slesers became deputy mayor). The People’s Party, considered among Latvians the most corrupt, and For Fatherland and Freedom, the most extreme on issues of nationalism, suffered significant losses in the country’s June 6 local elections. But the right-wing People’s Party still holds the largest share of seats in Parliament, for which elections take place in October 2010. Like Drevina, most members of the new party are in their 30s and have studied or worked abroad. “New Latvia will be a test for our democracy. Can we rise to power without a long [money] tail behind us?” Drevina says. The party was founded only two months before the municipal elections and has made minimal gains. But it is determined to boost its visibility and membership before the October 2010 parliamentary elections. Another new entrant into politics is Laura Mikelsone, Delna’s director, who stayed away from politics until last year. She worked in the Ministry of Economics and also as a human resources consultant helping colleagues start a business in China. Now, as part of a team of mostly young women who work at Delna, Mikelsone wants to see leadership that is capable of going beyond nationalism and embracing the full complexity of Latvia’s history. “I want a Latvian Obama,” she laughs. As new leaders, activists and artists are charting a more sustainable political and economic agenda, a new generation of entrepreneurs is also emerging to seek ways of creating sustainable businesses. One such is the green cosmetics company Madara, founded by three women in their 30s, which makes its products using local resources, from plants to labor. The women launched the company in 2006, raising small amounts of capital through friends, and have opened a new store in the thick of an economic recession. While these green shoots are springing up across Latvia, the austerity measures imposed by foreign lenders threaten to slowly burn them out, raising the specter of more social unrest this winter. A growing number of ordinary Latvians are criticizing the ways their government is handling the crisis. They point to the fact that while the United States and the European Union are growing their deficits to provide economic stimulus, Latvia is still pursuing the opposite strategy. I called Valdis Novikovs in October, four months after I left Latvia, to see how his company that sells off the assets of bankrupt businesses was doing. “Our business is growing, and we recently started negotiating sales with Lithuanians and Belorussians,” Novikovs says, catching his breath after a long day of work.